"If Obama names Warren, the momentum in the campaign would shift powerfully and immediately, with a rejuvenated Democratic base excited and fighting trim, ready to roll, ready to fight, ready to erupt with support that the selection of Warren would inspire." ...and I say to myself -"That's 10." Since Obama was elected, I noticed a propensity for Democrats to enthusiastically embrace broad sweeping generalizations that strike me as - well - delusional. These episodes are characterized by an extended period of self-congratulatory, mutually-admiring, media/blog linkfests that bloom like a 1,000 flowers across the intertube gardens. Eventually the meme withers on the vine and is recognized to be - well - delusional, at which point it is never mentioned again. Except by Republican blogs who point and laugh. So, I started accumulating a list. Adding Budowski's latest, I now have 10, and it is time to go to press. This list is by no means exhaustive. Please nominate any additional delusions I may have missed in the comments. If there is enough interest, I'll post a poll to rank them. Obama won a progressive mandate. America is a center-left country. Demographic realignment means a permanent Democratic majority is inevitable. A Republican cannot win Ted Kennedy’s Senate seat. It does not really matter what is in the Stimulus Bill, Democrats just need to spend for the sake of spending and once it is passed, it will be popular. The legislative "sausage-making" process is ugly and unpopular, but after Health Care Reform is passed people will like it and Democrats can run on it. The Tea Party is irrelevant. Democrats will keep their congressional majority. If Obama names Elizabeth Warren, the Democratic base erupts like a volcano and votes in November. President Obama picking a fight with John Boehner is a big win for Democrats because - you know- everyone would rather have Nancy Pelosi as Speaker of the House. 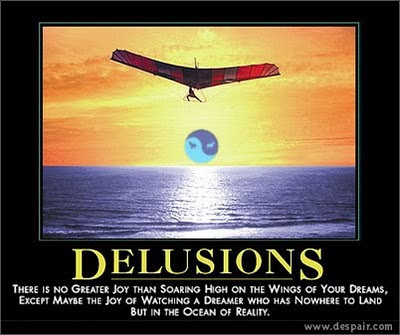 Look, Republicans are certainly not immune to delusions, but it does seem that One Party Rule is a requisite to achieve truly breathtaking disconnects from reality (Recall Tom Delay, Karl Rove, the "durable" 30-40 year Republican majority and Republicans keeping the House majority in 2006). 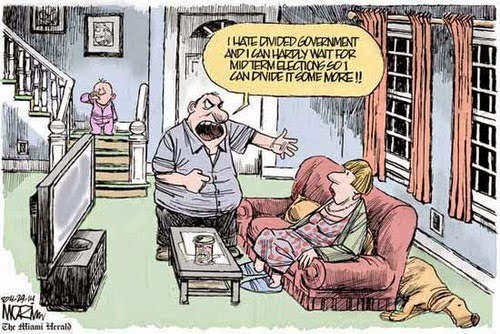 Help keep our politicians and pundits sane. 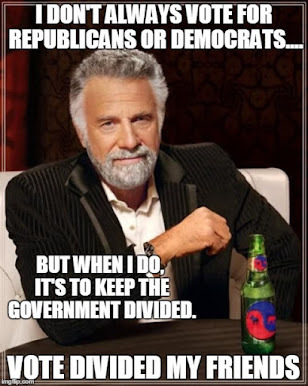 Vote for Divided Government in 2010. I vote for long division. That means fractioning the occasional rep. or two. They will have to REALLY want the job. Heh. I don't think that will dissuade them. If we only fraction a couple, they'll figure the odds are still in their favor. I'm afraid we'll have to do this the old-fashioned way and - unemployment via ballot box. Sri Lanka Ignored Warnings Of Potential Terror Attack - Evidence is emerging that the Sri Lankan government had advance warning regarding potential terror attacks but failed to act on the information. A Projection’s Impetus - Has it failed yet? Then it must continue.